How to Create the Best Wedding Invitations? Well, there is no doubt that wedding invitation is something that matters the most in a wedding. Besides giving all the information about your wedding to your guests, it also works as a beautiful memory of your special day. When you ponder upon what should be the wording of your invitation, so that it would look awesome, you can go through online wedding cards to get some wonderful ideas. You can get various designs, texts and fonts there. But if you are creative enough and like to play with words, you too can do it yourself. We request that please do come to bless the wedding couple. After this matter, the venue name and reception timing is given on the left and right corners of the card respectively. And after that, there might be a long list of “requesters” which include a bunch of the inviter’s near and distant relatives, under the title of “requesters” (or if there is any English word for that). But going beyond this traditional card, can we have some unique wedding cards? Of course, yes! And you have to think a little more and find some beautiful words for your invitations. 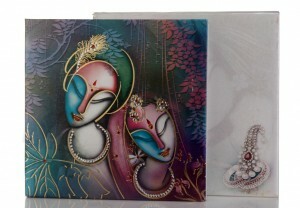 Let’s see how we can create some wonderful and unique Indian wedding cards. A love quote – You can include a beautiful love quote in the card to signify you as a couple. Examples of some love quotes are – “Love is made of a single soul inhabiting two bodies.”, “A flower cannot blossom without sunshine and we cannot live without love.”, and so on. Your favorite song – You can include a line of your favorite love song which should be very meaningful. Yours and your partner’s photo – Not single photos clung to your names! You can include an awesome photo of your pre-wedding shoot – of both of you together. Confetti – This will certainly wow your guests when they will open your invitation card with sprinkles of confetti! It will instantly give them a feeling of the forthcoming big celebration and set their party mood! Just trigger your imagination and you will get many such ideas. Don’t shy away of unusual thoughts – you will experience that your guests wouldn’t laugh at them, but they would love them and praise you!